Whether you are working on a farm or are just looking to dress appropriately for a cowboy themed party, you will need good western hats to complement your look. Country Square Western Wear is a reliable company that offers high quality Stetson cowboy hats for Ellensberg, WA residents. 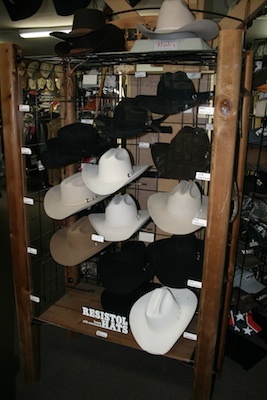 We have a vast collection of Stetson cowboy hats. You can choose the best one for your needs. If you are unable to choose the appropriate hat for yourself, you can take the help of our experienced staff. They will consider your preferences and budget and find you the best hat. Hats are not restricted for cowboys only. They can be worn and adorned by people from all walks of life and of all ages. You must find an appropriate store or company that provides authentic western hats for the entire family. We have been catering to the western hats requirements of Ellensberg families for a long time. Our western hats are secured from the best brands, thereby assuring high quality and durability. You can rest assured about the prices, too, as we charge reasonably. You can even compare our prices with other companies to ensure that you are getting the best deal. If you are unsure of whether we will be able to satisfy your choice of hats, you can take reviews from our past customers. Most of our customers do not go anywhere else for hats. They trust our materials and quality. If you want new western hats and you want to get the best collection in Ellensberg, feel free to call Country Square Western Wear at (253) 220-7674.